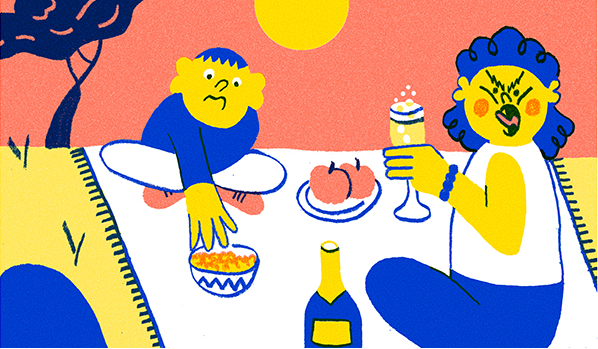 Jess Farrugia lays down the laws of eating outside. Illustration by Ruan van Vliet. A bus is not a train and, as such, different food-rules apply to different forms of public transport. I have outlined guidelines for each – these can be printed and attached to your tube map or bus timetable in case of emergencies. Before 10am, only quiet foods are permitted. A breakfast bar is OK, as is fruit, but cereal certainly is not; anything that crunches is likely to drive your fellow commuters mad. And don’t even think about adding milk – slurping is absolutely forbidden. That applies to tea and coffee, too. Don’t slurp, just glug with confidence and blink back the tears when the molten liquid burns your oesophagus. From 10am to 4pm, anything goes. That includes loud and smelly foods. Roll out a tray of sushi, tear open a family-sized bag of Doritos – the carriage is your cafeteria, my friend. But from 4pm to 8pm, we enter yet again into commuter hours. If you’re in need of an early or late dinner on-the-go, sandwiches and salads are the preferred option. Most people will tolerate noodles or a pasty, too. But under no circumstances – I mean it – should you bring McDonalds onto the train during this period. The wafty, salty smell of chips cooked in boiling fat is enough to drive the most patient businessman to extreme behaviour; if you’ve ever had a Happy Meal snatched from your hands by a hungry stranger, you’ll know to heed this warning. Bus etiquette is a little more relaxed, since journeys are shorter and the doors open more frequently; it’s a ‘do as you dare’ situation. That said, I’d advise against anything likely to spill, since our potted roads are not particularly conducive to portable picnics. Yes, this does require a section of its own. The night bus is the circus of the transportation world – normal social etiquette does not apply; bring your pints, shot glasses, trays of pickled cabbage, and oozing peperoni stuffed-crust. Big Mac? No problem, I’ve got fries for that. And pass around the barbeque sauce, we’re all friends here! It’s a veritable festival of delights. That is, aside from the high risk of vomit. However, if you’re travelling sober, I would advise against any attempt to eat. Keep your mouth, nose, and ears firmly closed – it’s for your own good. What’s left is much less regimented; airlines practically invented the notion of offensive food in confined spaces, so eat whatever they’ll allow you to take on board; as for the tube, it’s a notoriously liberal environment – I doubt anyone would offer a second glance if you decided to tuck into a lamb shank dripping with gravy; and no one cares what you eat in a cable car. Go ahead, do your worst. There are two types of people who eat in libraries: the desperate and the depraved. I can forgive the former, since I’m familiar with the quiet sense of self-loathing that comes with deadline-induced dinner substitutes, usually in the form of lack-lustre cheese toasties. The latter, however, are not worthy of forgiveness. When it comes to eating in libraries, I’d really rather you didn’t. In the park, time restrictions apply - so pay attention if you want to avoid falling on the wrong side of 7pm. Pre-7pm: a truly civilised affair. Lay out your picnic blanket, kick off your Birkenstocks and prepare for an alfresco banquet. If you’re doing it right, you’ll have a three-tiered basket filled with tomato salad, mozzarella sticks, homemade sausage rolls and the obligatory quiche. Embrace the Great Outdoors as the kings and queens of the modern world, armed with herby ‘slaw and a premade batch of Pimms. Post-7pm: no blankets, no blinis, just good ol’ fashioned booze! Opt for WKD, Vodka (Glen’s), lager, cider (2L bottle), or Lambrini if you’re looking to continue an age-old tradition. Eating in public toilets is prohibited. End of discussion. I’m under the impression that eating in shops must be done with some degree of discretion. Biscuits should be buried in handbags, chocolate bars should be stuffed in pockets, and grapes should only be consumed pre-purchase in timely intervals. Eating at the cinema is an art. Firstly, it’s dark. This makes any kind of snack that requires visual attention (i.e. to monitor ketchup/guacamole drippage) very risky business. Bear this in mind when ordering hot dogs or nachos. Most will opt for dry snacks, such as popcorn and sweets, but these come with their own pitfalls. Both will make you insatiably thirsty, forcing you to guzzle down gallons of liquid and commit to at least one mid-movie toilet break. But equally, those who steer away from tradition will likely come up against some resistance. If we learn anything from The Big Bang Theory’s Stuart, it’s that little pieces of chicken in tuppaware and a thermos of clam chowder are not appropriate cinema snacks. If in doubt, take a bottle of water and a packet of Werther’s Original Butter Candies – neither are particularly delicious, thus reducing the temptation to gobble and glug your way into an unfortunate situation. This is by no means an exhaustive list. There are many public places that have yet to be discussed: the swimming pool, the beach, the football stadium, and the hairdressers, to name a few. But the above should serve as a useful overview until a more extensive version of these guidelines can be developed.